The appetite for ad technology is just beginning to appeal to new markets in new ways. Expect to see significant growth in the sector over the next five years as marketers and large publishers invest significantly in technology at a scale we’ve never seen. The context for this shift: Ad technology is moving from a marketing or sales and operations expense to an enterprise-level IT investment. We’re now seeing very significant interest in this space by CIOs and CTOs at major corporations – beyond what we’ve seen in the past, which mainly came from the “digital native” companies, such as Google, eBay, Amazon, Yahoo, Facebook and Microsoft. Now this is becoming much more mainstream. Historically, digital media was a very small percentage of advertising spending for large advertisers, and a small percentage of revenue for large, traditional media publishers. But in the last two years, we have passed the tipping point. Let’s handle the two areas separately – starting with the marketer. First, let’s call the marketer by a slightly different name: the enterprise. Large corporations, or enterprises, have invested massive amounts of money in IT over the last 30 years. Every major function within the enterprise has been through this treatment – from HR to supply chain, finance, procurement and sales to internally driven traditional direct marketing (the intersection of CRM and direct-marketing channels, such as mailing lists and even email marketing). The great outlier here has been the lack of investment in advertising, which mainly has been driven by the fact that advertising is managed for the most part by agencies. Most marketing departments have allowed their media agency partners to take on the onus of sorting out how to effectively and efficiently spend their marketing budgets. And up until the past few years, digital marketing was a small percentage of spending for most major marketers. Since there really hasn’t been much value in investing in advertising technology at the enterprise level for marketers on the traditional side, there was little driving change here. But as the percentage of the marketing budget on digital advertising has grown, and as the value of corporate data to digital advertising has grown, a significant shift in thinking has taken place. Now we’ve got a way, through the RTB infrastructure – and, ultimately, through all infrastructure in the space – to apply the petabytes of corporate data that these companies own to drive digital advertising right down to the impression level. And we have mature infrastructures, bidders, delivery systems, third-party data and data pipelines,and mature technology vendors that can act on all this. None of this existed five years ago at scale. Just as the large marketers are enterprises, so are the large media companies that own the various online and offline publications that create advertising opportunities. Until the last few years, the very largest of the traditional publishing conglomerates were still not paying much attention to digital media since it was a tiny fraction of overall revenue. But over the last few years there has been a significant shift as executives finally realized that despite the lack of revenue from digital as a channel, from a distribution standpoint, digital media is experiencing explosive growth. And ultimately all the traditional distribution channels – from print to television to radio – are all being subsumed into the digital channel. You need to look no further than the people who have been hired into the major media companies in the last few years with titles like VP of revenue platforms, GM of programmatic and trading, director of programmatic advertising and VP of yield operations. These senior positions didn’t exist at these companies two years ago, and generally were areas reserved within the digital natives. The fact that we’re seeing new focus on digital media, with both senior roles and significant investments in people and technology, means that we’re likely to see additional significant investment by these media enterprises over the next few years. I expect to see the shift happen here quickly since the consulting companies upon which they and most enterprises rely to lead these initiatives already have media and entertainment practices. Suddenly major advertisers and publishers – who are all major enterprises – are looking at the opportunity to apply their significant IT expertise to marketing in a new way. So let’s talk about the way that IT evolved in other channels historically to try to understand what’s about to happen here. A major corporation will typically hire large consulting firms with a vertical practice in the area they want to modernize. Note that the biggest consulting firms – we’ll use IBM and Accenture as examples here – have developed vertical practices around nearly every department, large initiative or focus area within an enterprise. Also note that wherever these consulting firms step in to build a practice, they assemble a recommended “stack” of technologies that can be integrated together and create a customized solution for the enterprise. One interesting thing: In nearly every case, there are significant open-source software components that are used within these “stacks” of technology. When we look carefully at where they’ve developed practices that smell anything like marketing, they’re typically assembled around big data and analytics. There are obvious synergies between all the other vertical practices they’ve created and the intersection of using big data to inform marketing decisions with analytics, based on detailed analysis of other corporate data. So this isn’t a surprise. It also isn’t shocking that there are many major open-source software initiatives around big data, ranging from staples such as Hadoop to startups like MongoDB. But nowhere in the digital advertising landscape do we see major open source initiatives. Instead we see the massively complex Lumascape ecosystem map, with hundreds of companies in it. So when we look at the shift to enterprise IT for digital marketing, there are plenty of companies to plug into a “stack” of technologies and build a practice around. But there is very little in the way of open source, and no clear way to actually bind together all the vendors into a cohesive stack that can be used in a repeatable and scalable fashion. We are seeing some significant consulting firms come into existence in this space, including Unbound Company and 614 Group. I’m certain we’ll see the big players enter the fray as they sniff out opportunity. Who Will Win The Digital Media War? Lately I’ve had many conversations about the digital advertising market and how it’s evolving. I’ve also recently been asked about other companies, such as LinkedIn and Adobe, and how well they’re positioned to beat “whomever.” And by “whomever,” everyone almost always means Google. But more often lately, I’m hearing about Facebook, too. Well, it’s not so simple. I take a very different view of the market. I don’t believe there will ever be one winner in this space. Even from an ad-technology perspective, I don’t think all roads point to Google owning it all – although there’s little question that they dominate. And from a publisher perspective, Google is dominant in paid search but not in other areas. Yes, I did. Google has leveraged a massive market share in paid search, and grown into other forms of advertising as well. But for some reason, people in our space don’t seem to think of Google as a publisher. Google happens to be the biggest publisher of search – but, somehow, calling Google a search engine seems to mask for many people that Google is a publisher. They also are a publisher of maps with Google Maps. They publish video via YouTube. And they publish all sorts of other content related to the results of various vertical searches, including restaurant reviews and travel information. Google’s also a technology company, and yet – amid all the excitement about various office applications, self-driving cars, balloon-based Wi-Fi and all the other efforts – they are primarily a publisher, one that makes almost all of its money from the sale of advertising. Even their massive DoubleClick business is in many ways really about building opportunities for more ad revenue flowing through their ad exchange and back to Google, tied to a percentage of media spending. But even though they can almost legally be considered a monopoly, they are not the only publisher in search. Microsoft certainly hasn’t given up there. And beyond the two major publishers of search, there’s an entire ecosystem around paid search that Google can’t and won’t own. That opens up other opportunities. I see the market as a series of opportunities. Even if Google continues to be the dominant player across all forms of digital advertising, from a publisher or an ad-technology perspective, I don’t think that matters from a market perspective because the publisher space is far too fragmented for any one publisher to gain control. Any one publisher may dominate in one area, but won’t be a complete monopoly – not even in search. It’s even much less likely in other forms of media. So when people talk about who’s going to “win” in advertising, I think it’s more complex than one winner and many losers. There are many opportunities to win here. And many of these markets are more than big enough for the “second-place” player to have a very big business indeed. In many cases, there will be a large number of big businesses in various verticals. Television is a great example of a market where there are many big players and no one player that has significantly dominated the market, at least not in the way we think of Google dominating search. So what are the other areas we should be paying attention to? These areas could be very large – potentially as large as paid search – but at least as large as display ads or radio. Publishers: Obviously Facebook will dominate here. This means Twitter has the backup position in this market. Facebook is too far ahead for Twitter to come close any time soon. I think that Google+ is an outlier and could blow up at some point if Google keeps at it and really invests heavily, maybe in advertising Google+ rather than trying to gain share more organically. Technology: There are tons of players, but nobody is dominant yet. And every major player wants to be the big gun here. I expect that, eventually, Google, Adobe and Salesforce will dominate, either through organic growth or acquisition. There are a lot of smaller players who could rise quickly depending on how innovative they prove and how good they are at executing. Secondary Marketplaces: I think AppNexus will win. Others will play. Publishers: Clearly, this belongs to LinkedIn. Google+, Facebook and Twitter will also play here, but it’s uncertain how much market penetration they’ll achieve. I’d guess that Twitter has a good opportunity to be bigger here than in the consumer space as a secondary player. Technology: Again – too early to know. I like Rallyverse quite a lot, although they’re playing in several places here. Secondary Marketplaces: Too early to be certain. Publishers: Obviously Hulu is a standout. You can’t ignore YouTube, either. Netflix and Amazon are very focused, and Microsoft’s Xbox is super interesting. But video and television content over the Internet is very fragmented, and I don’t see one strong winner. Technology: Freewheel seems to be getting tons of traction (quietly, too). Secondary Marketplaces: Clearly Google’s got a good foothold because of its anchor-tenant relationship with YouTube. Tremor had a great IPO, and there are many players like TubeMogul, YuMe and Brightroll – but this space looks to be about as fragmented as the television ecosystem, or even display ads. Part of the reason is just that there’s a lot of demand and money floating out there looking to be spent on video advertising. 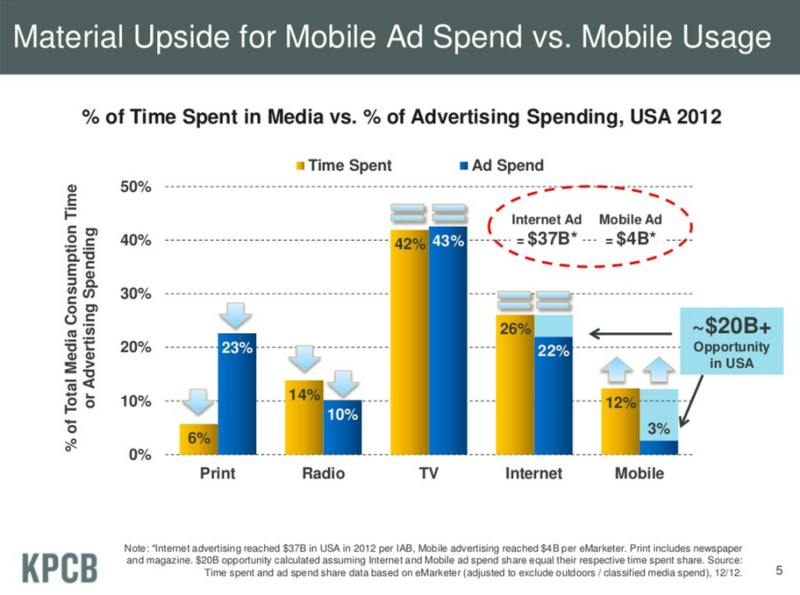 Publishers: Mobile is not a media type. Well, sorta. But it’s not a media type that so far is significantly differentiated as one. I suppose you could point at Apple and Google (as leaders?) for their app and content marketplaces. Technology: This part of the market is super fragmented. Secondary Marketplaces: I’m looking forward to Google and AppNexus duking it out over this marketplace from the exchange point of view – but there are many ad networks in this space as well, including Millennial Media, which is clearly the powerhouse of the market. Let me break out of my model for a moment and say that while the market has certainly fragmented into players focused on each of the various channels, I think we’re now starting to see a lot of investment in cross-media initiatives. These range from publishers to technology companies and marketplaces. But the real interesting thing to me is that in the ad-technology space we’ve rarely seen the ability for companies to support multiple media types simultaneously and become a dominant player. That is changing. Publishers: Google, Yahoo – yes, I said Yahoo – Microsoft, Amazon, Apple, AOL and a plethora of others are starting to gain real cross-media traction. I don’t see any one publisher dominating across media, but certainly there will be publishers who stand out because of their cross-media footprint. Technology: Obviously Google stands out here. But watch out for AppNexus, which is really investing heavily in video, mobile and social to extend beyond its display roots. Secondary Marketplaces: Again – I think it’s Google and AppNexus that are really poised to win here. Local advertising is the largest pool of dollars in the US advertising industry, but is also by far the most fragmented and complex marketplace. EMarketer’s numbers below are fascinating. They show clearly that local advertising is massively larger than digital media overall, and while traditional local ad spending, at $109 billion in 2012, seems to be stagnating (I’m not sure I buy that by the way – I’ve seen charts like this before that expect local traditional to stagnate but it hasn’t), that pool of dollars is double the next largest media. This chart expects local digital to double in size by 2017, where it would sit in the same magnitude as the big-league spending areas, including display ads, search and television. The problem with local as a category is that it’s a cross-section of every other media, including television, radio, print, digital and a variety of other media types. And the spending is wildly sliced up across many more advertisers than national media. In national media, roughly 9,000 advertisers make up more than 90% of spending across all media. In local, there are millions of businesses spending money. This points to a significant problem scaling spending, especially on the supply side of the market. Many companies over the years have taken a run at local in the digital space. They range from companies feeding the paid search listings with local business ads to local offers through companies like Groupon and media efforts like Patch that push digital news at the local level while driving ad sales at the national level. There have been hundreds, if not thousands, of companies dashed upon the shores of digital local for every company that’s had some measure of success. This isn’t shocking – startups have spectacular flameout rates – but it is clearly a space with unique hurdles that few have figured it out. Even those we could consider successful, such as Groupon, are widely scrutinized and criticized when it comes to how they’ll scale their business. There are few models in digital that have scaled across large numbers of media buyers. The rule has been for the most part that other than paid search, there have been only marketplaces that scale on the supply side. Paid search has roughly 500,000 active advertisers participating in the various marketplaces – the main players today are Google and Bing. Google has done a great job of leveraging that advertiser set to apply their combined demand across other marketplaces, but even adSense is a comparatively small pool of spending compared to paid search. So the biggest game in town hasn’t conquered local advertising yet – and they seem far from doing so still, although much closer than in the past. But there is already a huge amount of money spent on local advertising – with millions of participating companies and thousands of competing publishers. It’s a business that’s been in place for hundreds of years, but only in the last decade has it really suffered. In basic media theory we see that where audiences concentrate, media dollars will flow. Generally the theory is that media dollars flow in some proportion to the amount of time spent with those media. And where those things are out of whack, analysts talk about “upside opportunity.” Mary Meeker’s frequently updated deck talks about the disproportionate time spent on digital media vs. the dollars spent as an example of the opportunity in digital (lately she focuses a lot on mobile). What I love and hate about this analysis is that while TV has always been a fairly even match against time and dollars spent and, until the last 10 years, radio was similarly matched, there’s always been a strange outlier on this deck. Print media has always looked basically like it does on this chart. This disparity is generally used by analysts to suggest that print media is doomed. The problem with that analysis is that it’s deeply flawed and doesn’t take into account the reasons why print has such a disparity. When you dig into newspapers, this disparity is even greater. And the more locally you dig in, the greater the disparity – with local newspapers disproportionally getting more dollars than time spent. The reason for this is so simple that it’s rather shocking. My friend Wayne Reuvers, who founded LiveTechnology (a company most have never heard of because it focuses on local traditional media creative production and operates behind the scenes) is the most expert person I know on local media. What he means is that local advertising dollars are spent mostly by non-professionals, usually someone working within the local business. And as any local business owner will tell you, local media providers trying to sell advertising and marketing opportunities inundate them with sales calls. National media salespeople generally don’t go out and pitch ad opportunities to media buyers, they respond to RFPs. While there’s plenty of outreach from sell side to buy side, it’s mainly evangelical – making sure the buyers understand what the publisher has to offer, often not a direct business pitch with an expectation of dollars on the line. This is maybe not so true for ad networks, but for publishers it’s generally true. Newspapers are a category that has been around for hundreds of years, and are the oldest of the local media. The models are mature and extremely efficient. When I’ve talked to local businesses about how they spend advertising dollars and why they spend so much on newspapers compared to the other forms of media, they’ve generally said, “My sales rep at the paper is great, he or she knows me and knows what I need. It’s super easy to execute a buy there, they do almost all the work for me. They’ll even do the creative for me. I just need to pay them money.” Changing the offer or creative in newspaper buys is also easy, so if the buyer needs to focus sales on a loss leader product or have a new promotion, an ad change can be made in a day or two. Local businesses often find the costs of television spots so high that they can’t be justified. And when they’ve tried to buy display advertising from big publishers, nobody returned their calls. Paid search works well for some businesses, but not so much for others. The only other place where local businesses consistently spend money is on yellow pages. Not surprisingly, this is another place where they are sold ad space constantly with reps who are frequently in touch and educating them on new ways listings are being pushed to digital media. Reuvers believes that newspapers have dropped the ball in the move to digital. He calls newspapers the first local search engines, and has been so evangelical about their opportunity that he published a manifesto about five years ago to push local newspapers toward a winning model. It is a fascinating read – if a bit out of date – and basically says newspapers should own the space. These salespeople should focus on the community and form relationships with local businesses, meaning both small and medium-sized mom-and-pop businesses and local locations or branches of national or regional companies. These national/local companies spend 80% of local ad dollars but have wide discretion about where they spend those dollars. When companies try to run at local with a national sales force, they often fail. Local business owners without a lot of technical skills need streamlined ways to spend dollars in a self-service and lightly assisted way. Scale will come for those who figure out self-service, but finding a way for scalable assisted buying is critical to success. Local businesses need simple ways to update their advertising or offer based on what works for them. This may take the form of updating the creative message or changing the format. While not deeply analytical on what advertising works, most local businesses are surprisingly astute at understanding what works. National digital folks tend to discount how well these local businesses understand the effectiveness of their ad dollars. Few local businesses can afford to waste ad dollars, so they are pretty careful about their spending. That said, they have limited venues to spend money on so they generally can figure it out without much work. Groupon figured out the hard way that local businesses are not stupid about the economics of marketing. There has been a lot of backlash among businesses toward any sense of being taken advantage of, strong-arm tactics or salespeople who don’t understand their business.